MELROSE, Minn. (CNS) — Bishop Donald J. Kettler of St. Cloud said he hoped a juvenile confessing to intentionally setting a fire that damaged the historic St. Mary’s Church in Melrose will help in the “healing process” for parishioners still coping with the tragedy. The juvenile was charged with arson in the first degree, according to a June 20 news release from the Stearns County Sheriff’s Office. The juvenile was 13 at the time of the offense. The Stearns County Juvenile Court proceedings are by law confidential because of the juvenile’s age at the time of the offense. No further information about those proceedings can or will be released, the statement said. 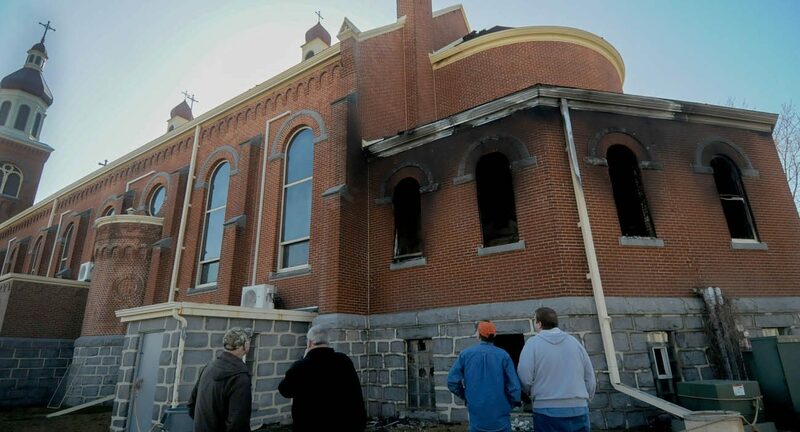 New reports said that an early morning fire March 14, 2016, damaged about 30 percent of the 118-year-old Romanesque Revival-style church. The main altar, handmade in Germany, was destroyed. The church, dedicated in 1899, is a landmark in Melrose, which is about 100 miles northwest of the Twin Cities. Bishop Kettler said he is thankful for the persistence and commitment of the local, state and federal authorities who investigated this arson case. He also asked for prayers from the people of the Diocese of St. Cloud. The Melrose community has been divided over whether to rebuild or restore the church since the fire. Initially, the parish submitted a proposal to the St. Cloud Diocesan Building Commission for full restoration of the existing structure, which was rejected. About 450 people gathered in February of this year at Melrose High School to see a proposal for a new church. An additional 250 people tuned in to the live video stream through the parish’s website. The parish created a church-building team to move the plans forward for a new building which would be located near the current church site and school. A delegation from St Mary’s presented a proposal June 12 for the new worship space and facilities to the Diocesan Building Commission, according to the church’s website oneinfaith.org.